Perhaps you’re among those fortunate enough to have witnessed a green flash at the instant the sun sets; however for most, they’ve only heard of the phenomenon. One such area for viewing the green flashes is Puerto Vallarta, Mexico. Physical optics— By means of refraction and dispersion of the sun’s rays, the various length light waves reach the eye at slightly different times and speeds. Light moves slower in the cooler denser air, hence the higher frequency light waves, i.e., those with the shortest wave length (green & blue), are refracted more than are the lower frequency light waves (red & orange). 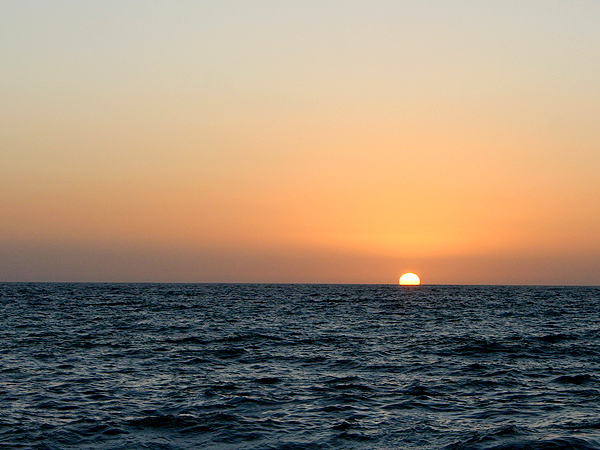 This greater degree of refraction or bending allows the green and blue light waves to be seen over the earth’s curvature immediately after sunset, whereas the red and orange light waves are blocked by the earth. Atmospheric inversions and temperature gradients may even increase the separation of light waves creating a more vivid green flash. Any degree of haze in the air will disperse the very shortest of the light waves which are the violet and blue colors of the spectrum, thus leaving green to be the last color seen. 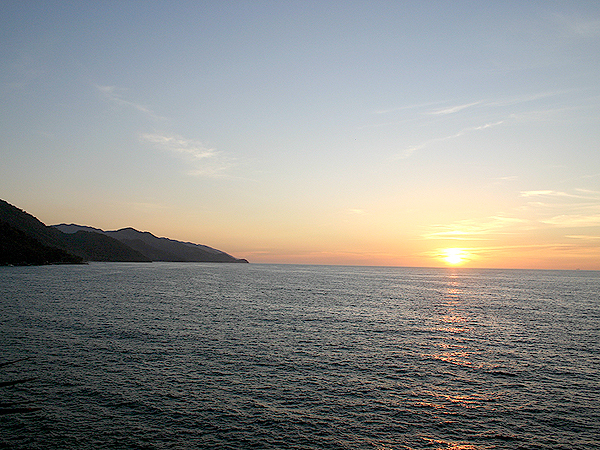 During the winter months in Vallarta, it’s not uncommon to have an evening air temperature the same as the Banderas Bay water temperature. The air is always very clean and clear and there is often a small amount of haze; making conditions ideal for observing green flashes at sunset. Physiological Optics—After looking at the bright sun, even for a few seconds prior to sunset, there is some degree of bleaching of the retina’s red-sensitive cone photo pigment. This bleaching effect, sometimes referred to as red fatigue, distorts color perception; thus causing the light seen just before final sunset that would normally be perceived as yellow, to appear as green. As an important reminder, the brightness of the sun changes by a factor of two every minute prior to sunset. Therefore, it is safe to look at the sun when it’s right down on the horizon but staring at it just a minute or two prior to sunset could result in eye injury. As a rule of thumb; if the sun is too bright to look at comfortably, don’t look at it! Psychological or other influences—After attending hundreds of parties in Vallarta over the past ten years we have noticed that the odds of seeing green flashes (not to be confused with hot flashes) are directly proportional to the quantity of margaritas consumed! This is especially true with women because they seem to observe the green flashes much more often than do men. Since there is no empirical data or scientific explanation for this phenomenon, we can only attribute this to the party atmosphere that exists nightly in Vallarta. Okay, now that we have a better understanding of exactly what green flashes are and what causes them, let’s determine how best to witness them. Research data indicates that under ideal conditions, green flashes are so inconspicuous that even the trained eyes of experienced green flash observers will witness only one green flash out of every six sunsets; they will pass virtually unnoticed by most novices. 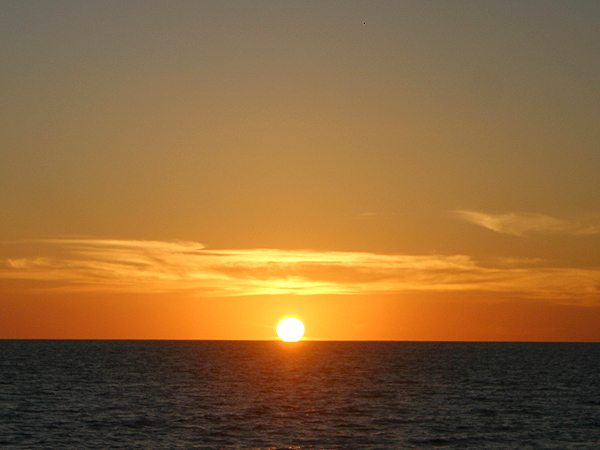 Those that study the green flash phenomenon always use optical aids such as binoculars or telephoto lenses, thereby greatly enhancing their odds of seeing the flash. Although beautiful sunsets are worldwide, certain conditions must be ideal in order to increase the chance of seeing a green flash. They include weather, air quality, viewing surface (water or land), latitude, and time of year. Sunsets are best viewed over large bodies of water. Green flashes are most often seen in the lower latitudes during the winter months when water temperatures are slightly higher than air temperatures and obviously, the air must be free of dust, smog, and other pollutants. Some might also include the prerequisite of being under the influence of their favorite beverage for seeing the green flash! Puerto Vallarta, located on the innermost beaches of the 25 mile diameter Banderas Bay on the Mexican Riviera, provides the perfect location for viewing sunsets with or without green flashes. 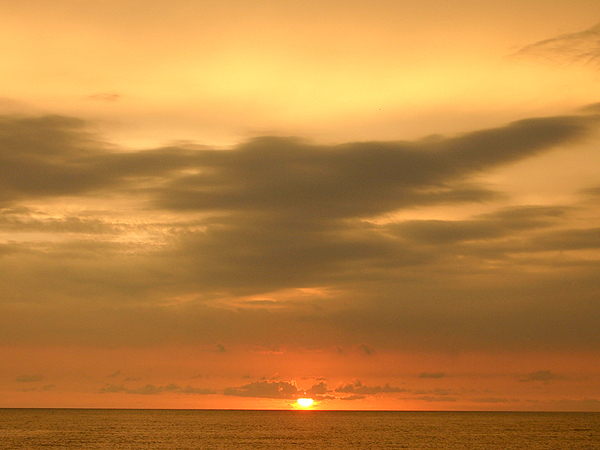 During the seven month “high season”, we are assured of at least 210 consecutive magnificent sunsets. There are hundreds of beautiful restaurants, lounges, and cantinas scattered along a 30 mile stretch of shoreline where thousands of visitors watch the sunset every evening in Vallarta. The majority of these beachfront establishments face to the west or southwest, i.e., directly toward the setting sun, thus providing an endless supply of colorful evening skies; no two alike. Of course, almost all retirees living in Vallarta reside in seaside condos, also facing to the west or southwest, where they never tire of watching the majestic sunsets. 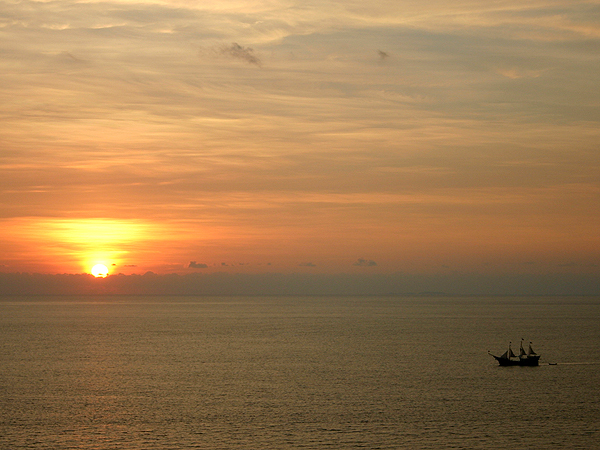 The evening skies in Vallarta are so spectacular that a number of boats are dedicated for “sunset cruises”; where tourists dine out in the center of Banderas Bay with music and a picture perfect sunset as a backdrop. Also, the evening departures of the huge passenger cruise ships are always in a southwesterly direction from the maritime terminal, thus providing thousands of tourists a beautiful photo-op as they cruise away from this wonderful tourist destination. In fact, it would probably be safe to say that very seldom do any tourists leave the area without taking a number of glorious sunset photos as reminders of their vacation in Paradise. Since most of us have never really witnessed the elusive green flash at sunset, where better to have our first such sighting than on the beach in Vallarta during a comfortably warm winter evening with a frozen margarita in hand? Who knows, perhaps with an adequate consumption of your favorite beverage, you might even witness a blue or violet flash! During the “high season” of November through May when the average daily temperature is 73°F with virtually no chance of rain, thousands of people religiously watch for this rare instantaneous event every evening at sunset.